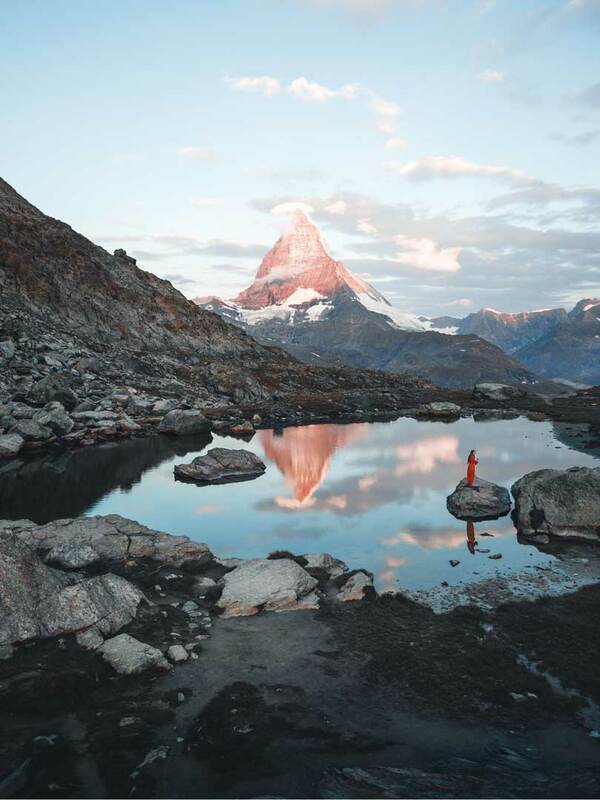 If you are a landscape photographer, capturing the Matterhorn is very likely already on your bucket list. 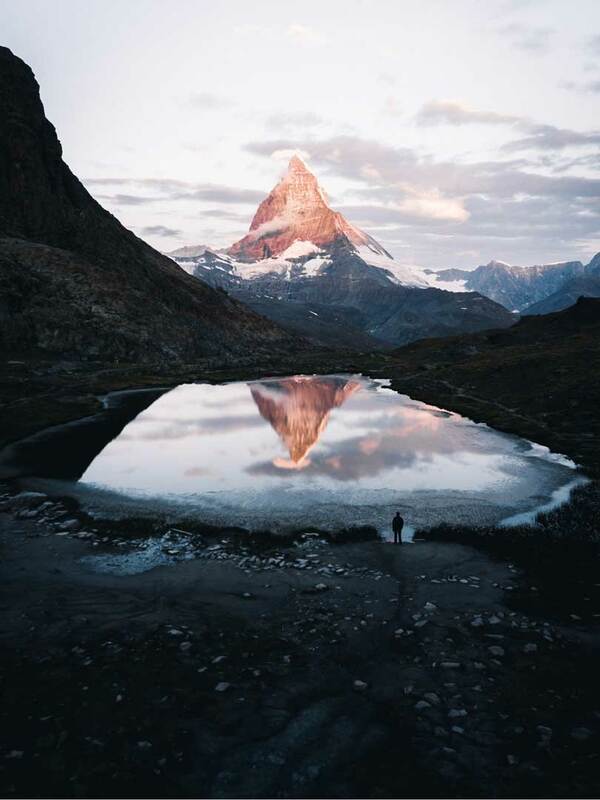 After years of taking images, in late August 2018, we – Aron, Hannes and Stefan, finally made this dream come true and started our journey to Zermatt to experience and capture the famous Matterhorn view. 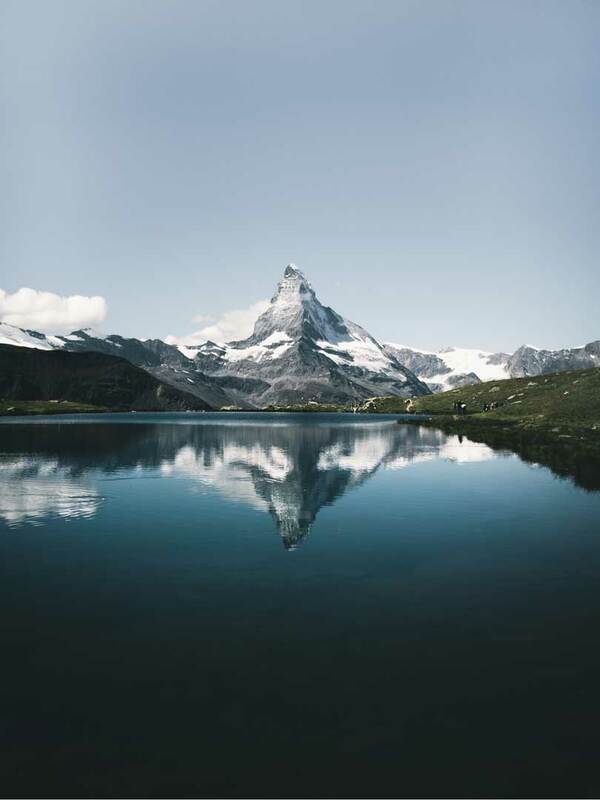 We want to share the experiences that we’ve made during our stay in Zermatt and give some advices for first-time travelers and photographers. After a long drive along various swiss mountain passes and stunning views, we finally arrived at the Täsch village, where we parked our car, since you aren’t allowed to drive into Zermatt with your private car. During the train ride, we already got a first impression of what kind of diva the Matterhorn could be, since it was covered in thick clouds and it started to snow above 3000m! After we had arrived in Zermatt, a small electric vehicle picked us up and drove us to our hotel. During the 5 min ride we were amazed by the beautiful village with its traditional houses and special atmosphere. Without cars allowed, only people from all over the world were strolling around through the picturesque and narrow alleys. The combination of old and original houses next to all the modern hotels in a traditional look, accompanied by spectacular mountain views, is truly unique. 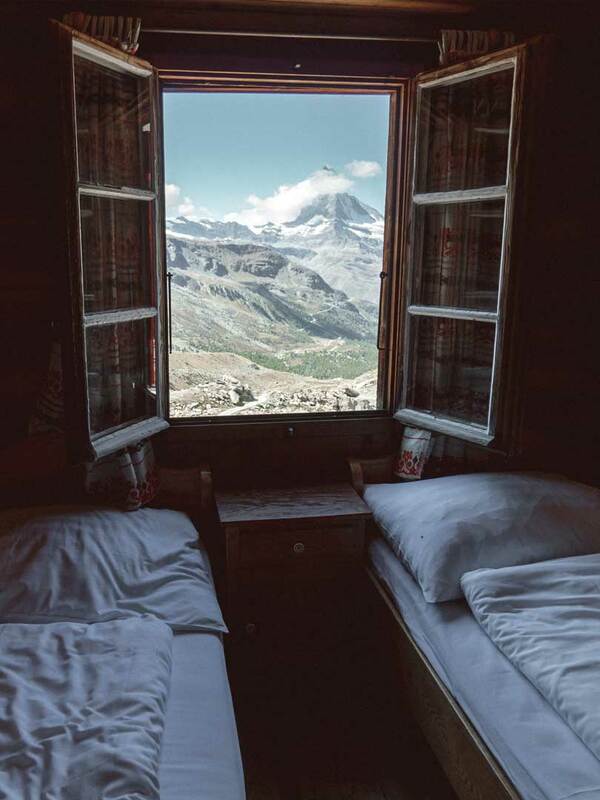 When we checked in at our hotel – Chesa Valese – we were amazed by the swiss style and the insane view. 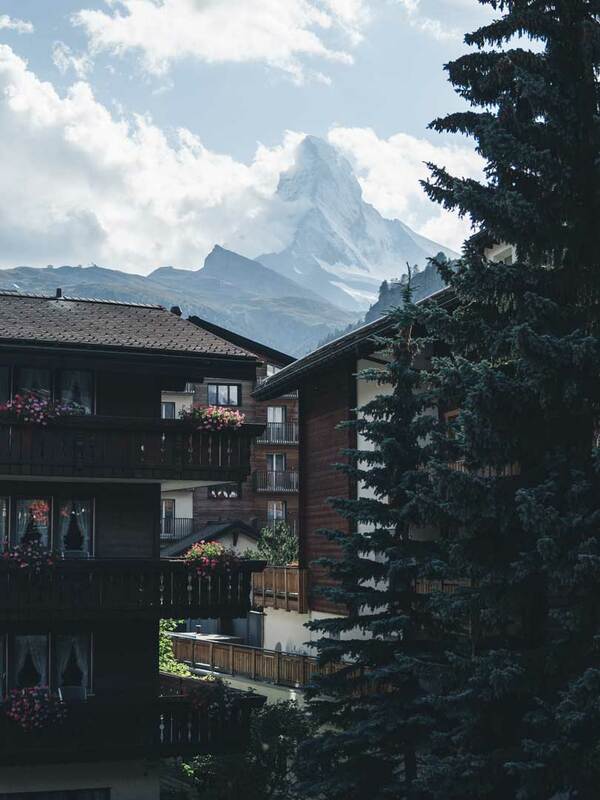 Just at our arrival in the hotel, the Matterhorn started to show up again, what we could directly observe from our balcony! Around sunset time the first photo-mission was due: Two minutes away from Chesa Valese, we visited the famous Kirchbrücke und got a shot with some nice evening light. Witnessing the beautiful scenery right from the village, it wasn’t surprising that this bridge became quite crowded in the evenings. Satisfied with our first impressions, dinner was waiting for us. 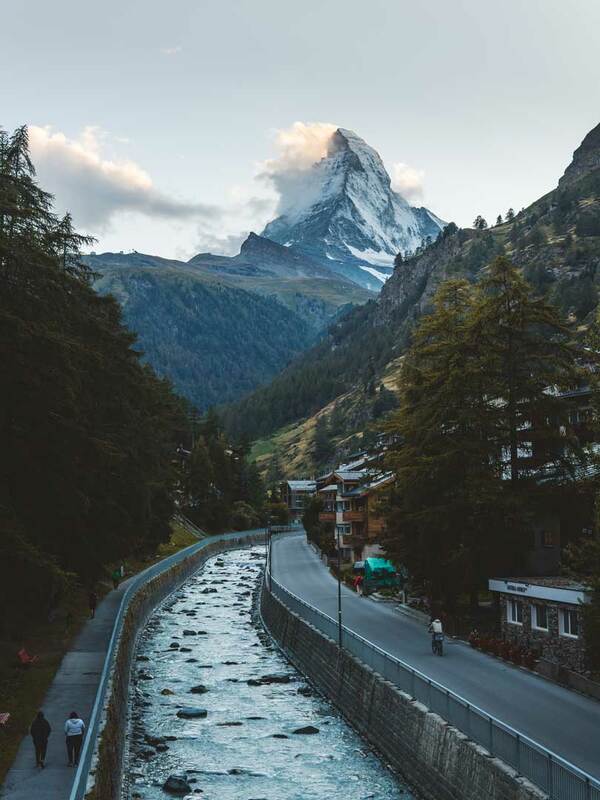 The following morning, after enjoying a healthy and rich breakfast, we took a 30-minute ride with the Gornergrat train, a rack railway that takes you to an altitude of 3089m up to the Gornergrat – spectacular views above the village of Zermatt and on the Matterhorn included. Departing the train, you can immediately feel the altitude: The air is noticeably thinner, especially when carrying a heavy backpack, and temperatures are a few degrees colder. 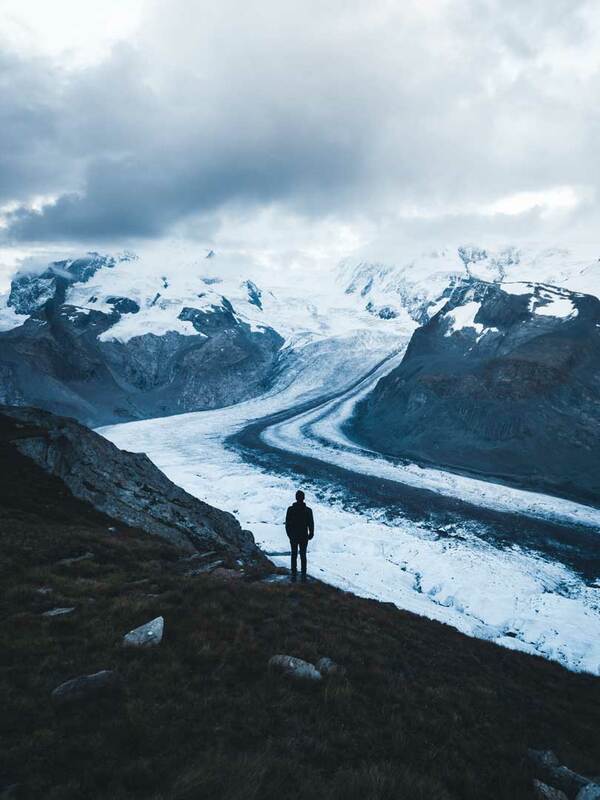 Walking a few minutes from the train station, you can reach the viewpoint over the entire Gornergrat glacier: the Small Matterhorn and the Matterhorn. Watching at massive glaciers and standing in between 29 mountains which are higher than 4000m is a truly remarkable experience. We took our time there, prepared lunch and just enjoyed the view. On the way down, we stopped at the Rotenboden station and decided to take the quick descent to the Lake Riffelsee. On our last day in Zermatt, we took the Sunnega train. From the summit, it ist only a short stroll to the Lake Stellisee – another famous lake, which offers a spectacular view on the Matterhorn. Unfortunately, during the day this place was insanely crowded – the light wasn’t special either. However, from a photographer’s view, we had rarely seen a place shining that special during regular daylight conditions. Once you’ve made it there, we recommend the 15 min walk to Fluhalp. You can enjoy a delicheious lunch, ice-cream or beer with a perfect view on the Matterhorn (or not, like in our case). 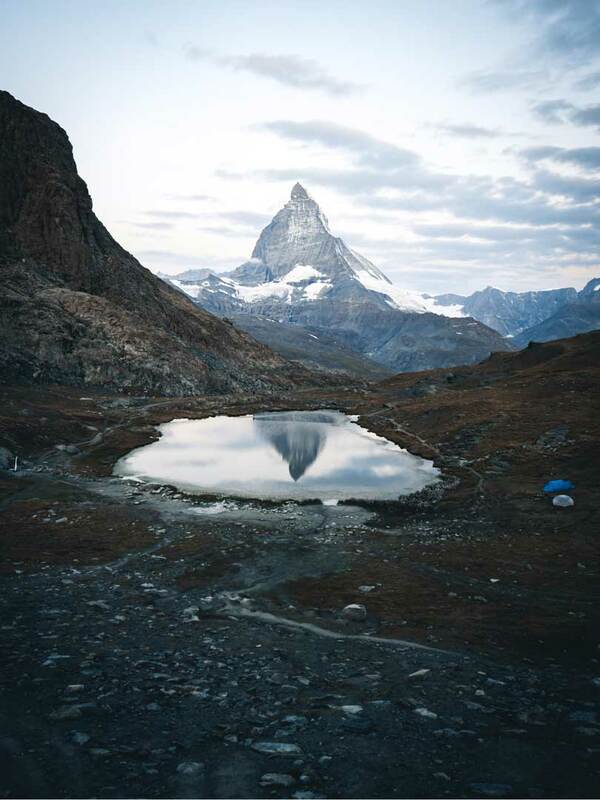 If you want to experience a night in the mountains, this place offers rooms for the perfect Matterhorn photo scenery. We clearly would not have minded staying there! On our descent we passed the ancient village “Findeln”. It is a scenery what most people would probably describe as typically Swiss! I guess the inhabitants didn’t complain about the views back then. After heading back to the hotel and repacking the backpacks, we walked to the Gornergrat train one last time. The plan sounded simple: Get back to Riffelsee, set up the tent, shoot an incredible sunset and sunrise and head back down. In the best case, we would bring along many images and memories. However, on the way up, we were not really optimistic, since temperatures were forecasted a little above zero-degree Celsius and the sunrise situation didn’t sound promising due to clouds. But beeing it our last night in Zermatt and not having an accommodation anymore, we decided to do it anyways. After getting ready for the night, the sunset was still not special at all and the Matterhorn got covered in thick clouds, leaving us with little hope for the next morning. The night was freezing cold, even our tents got covered under a small layer of ice. But this all was forgotten when we woke up and realized that all clouds disappeared overnight. Full of motivation but still tired, we grabbed our cameras and shoes, jumped out of our sleeping bags and waited for the light. Once the lightshow started, we stopped, stared and clicked the shutter as often as possible to capture this perfect photo scenery. The amazing images, photo scenery and special moments made it possible to leave Zermatt with full satisfaction. If you liked our images and experiences, we would appreciate if you take a look at the Instagram Profiles of Aron, Hannes and Stefan. Also, we put together some recommendations for all of you planning to visit this beautiful place in Switzerland. 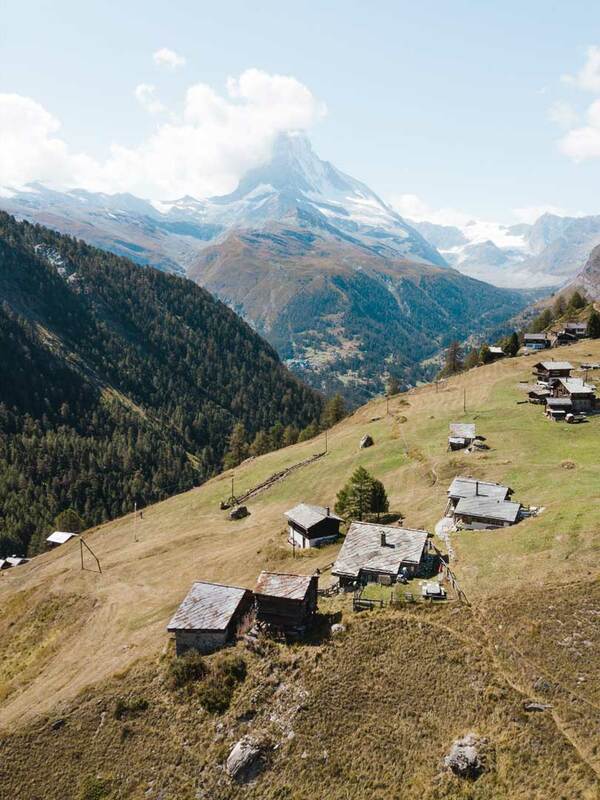 ⛰️ Depending on where you come from, the ride to Zermatt can be long. Enjoy the amazing scenery along the way! 🚗 If you want to save money, choose one of the various outdoor parking lots in Täsch instead of the parking space at the train station. ⛅ Spend at least three nights in Zermatt. There are so many places to see and the Matterhorn could be covered in clouds all day long. 🚆 Get a ticket for the mountain trains! You are much more flexible and you can see all the amazing places around Zermatt in a short time. But plan ahead and keep the time tables in mind when planning an ascent or descent. 🌄 Witness a sunrise at Lake Riffelsee. It’s simply stunning and offers a perfect photo scenery! 👨‍👩‍👧‍👦 Try to get up early to avoid the huge tourist crowds in the mountains! 👚 Bring some warm cloths even when it is summer. Wind and temperatures can become pretty cold up at 3000m above sea level!